The recent trend away from cool conditions early in the growing season continued in June, with above normal monthly temperatures occurring statewide. 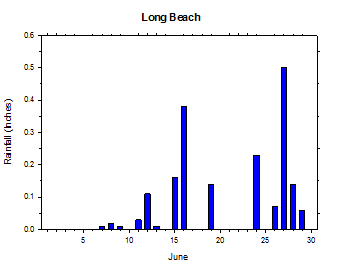 Aside from a wet period around mid month, most of June was warm and fairly dry. The weather became somewhat more active again late in the month, although temperatures remained rather warm. 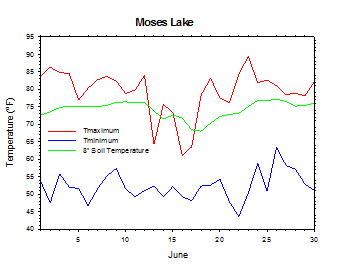 Meteorological highlights of the month included a high temperature of only 46 degrees at Garfield East on the 17th, and a 90 degree high at the Tri-Cities on June 2nd, along with 1.15 inches of rain at Brays Landing on June 13th. Following a very dry start to June, a modicum of relief came for dry-land wheat growers in the form of a wet upper low that provided much needed rain to eastern areas on June 17th. Despite the benefit of the widespread rainfall, which included 0.87 inches at Fairfield, much of the drought damage was already done. By contrast, cherry growers were equally pleased that the rain largely avoided central areas. For much of the growing season so far, the warm and dry weather has been welcomed in central Washington, while eastern wheat growers have lamented the persistent drought conditions. June commenced with dry and warm weather. High temperatures were mainly in the 80s in central areas, with 70s elsewhere, and 60s at the coast. Lows ranged from the 40s to low 60s. Skies were mainly sunny, except at the coast, and winds were generally light. After an early period of balmy and benign weather, slightly cooler conditions arrived on the 10th. High temperatures reached the 70s to low 80s east of the Cascades, and 60s to low 70s in the west. Lows varied from the 40s to around 60 degrees. 0.14 inches of rain fell at Lawrence, in Whatcom County, and it was breezy in the east, with wind gusts up to 38 mph at Broadview. Highs on the 12th ranged from the upper 50s at the coast to near 90 degrees in parts of north central Washington. Lows were in the mid 40s to 50s. The large east-west temperature gradient was due to warm southerly flow ahead of an approaching cool upper low. 0.86 inches of rain fell at Stevenson, as winds increased. June 13th was a very cool and cloudy day statewide, with highs only in the upper 50s to around 70 degrees thanks to rainfall associated with a storm system. Lows were in the 40s and 50s. 1.15 inches of rain fell at Brays Landing, with gusty winds in areas like Dayton. The 16th was another damp and unsettled day. Light rain fell across many parts of the state, and 1.1 inches was measured at St. Andrews. Highs were in the mid 50s to low 70s, with lows ranging from a chilly 32 degrees at Moxee to the low 50s in warmer areas. 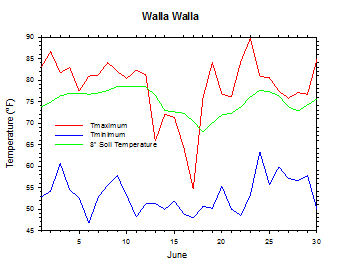 As rain wrapped westward and back into eastern Washington, wet and very cool weather lingered in eastern border areas on June 17th. Highs reached only into the upper 40s around Pullman, although most other areas topped out in the 60s and 70s. Lows were in the mid to upper 30s around Pullman, but the low to mid 50s in many warmer areas. 0.87 inches of rain fell at Fairfield, south of Spokane. Many western and central areas remained mainly dry but somewhat breezy. High temperatures were warmer on the 18th, with upper 50s to mid 70s in the east, and upper 70s to low 80s in central areas. Lows were in the mid 40s to low 60s. Rain tapered in the east, but Walla Walla still recorded a daily total of 0.41 inches. Highs on the 19th peaked in the mid to upper 60s at the coast, and climbed to near 90 degrees in parts of central Washington. Lows ranged from the 40s to low 60s. A weak front arriving late in the day dropped 0.29 inches of rain at Lawrence, and winds gusted to 34 mph at Underwood. Highs on the 23rd climbed into the mid 90s in parts of central Washington, while lows were mainly in the mid 40s to mid 60s. Light rain fell in parts of western Washington late in the day. High temperatures on June 24th topped out in the mid 60s to 80s, with mild lows in the 50s to mid 60s. 0.2+ inches of rain fell at the coast, along with light totals at some central Washington sites. High temperatures on June 26th ranged from 90 degrees in north central Washington to the 60s and 70s at many other locations. Lows bottomed out in the 50s to mid 60s, except 45 degrees at Sequim. 0.76 inches of rain fell at Davenport, and 0.73 inches was recorded at Stevenson, although other parts of the state received no rainfall on the variable and showery day. High temperatures reached the 60s to low 80s on the 27th, with lows in the 50s to low 60s. Rainfall amounted to 1 inch at Stevenson, with appreciable totals scattered across the state. On the final day of June, highs topped out in the 70s and 80s, with mainly dry and calm conditions. 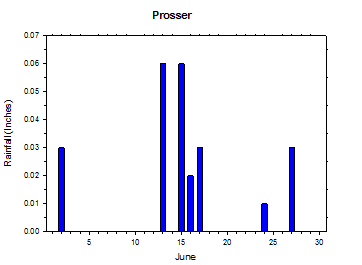 The average June temperature at Prosser (WSU IAREC) was 66.7°F, which is 1.2 degrees above average. The average high temperature was 80.3°F, which is 1.7 degrees above average. The average low temperature was 50.7°F, which is 0.5 degrees above average. 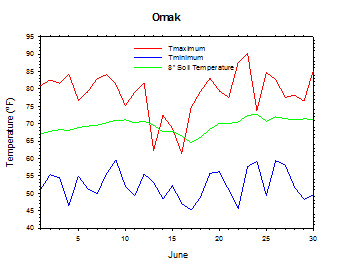 The maximum temperature recorded last month was 90.4°F on June 23rd, while the coolest daily high was 63.6°F on June 13th. 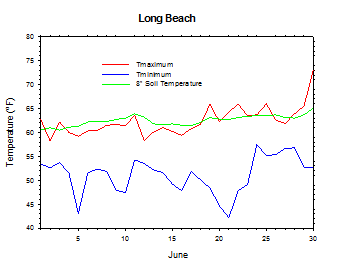 Low temperatures ranged from 61.5°F on June 26th to 41.0°F on June 16th. Daily average temperatures ranged from 74.4°F on the 23rd to 55.4°F on the 16th. The monthly precipitation total was 0.24 inches. 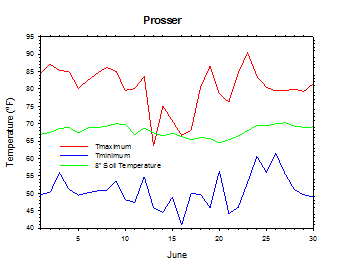 The average wind speed was 4.8 mph, and the average 8 inch soil temperature was 67.9°F. 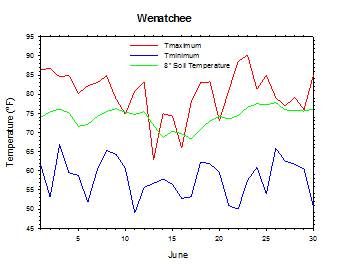 Wenatchee (WSU TFREC) recorded an average temperature of 69.4°F, which is 2.6 degrees above average, while Walla Walla's average monthly temperature of 65.9°F was 1.0 degree above average. 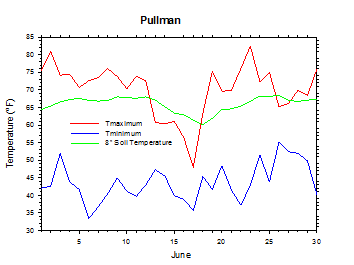 Pullman was one of the cooler spots in the state, with an average June temperature of 58.0°F. In western Washington, Mt. 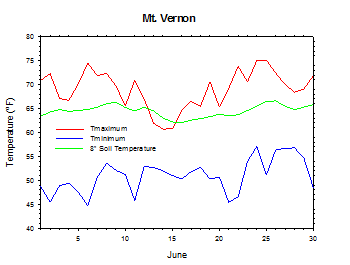 Vernon's average temperature was 59.2°F, which is 0.7 degrees above average. 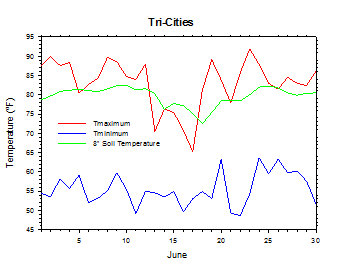 June 2nd: The high temperature at the Tri-Cities soared to 90 degrees. 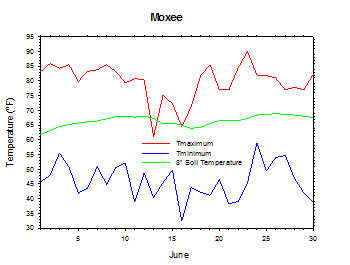 June 16th: The temperature at Moxee plunged to 32 degrees. June 16th: 1.1 inches of rain fell at St. Andrews. June 17th: The high temperature at Garfield East was only 46 degrees. As of June 16th, harvest was underway for central Washington sweet cherries, as well as vegetables like asparagus and green onions, while grapes were showing on the vine, and apricots were coloring nicely. In the dry-land areas of eastern Washington, very dry weather was taking a toll on crops, as substantial winter wheat yield loss was expected. As of June 23rd, the harvest of early varieties of berries and apricots was occurring, while apples and pears were developing color and looked very good. Cherries were generally of high quality, although the winds caused some bruising of delicate Rainiers. For eastern areas, welcome moisture was received during the third week of the month, although it was too late for recovery in some wheat fields. As of month's end, cherry harvest continued, with reports of some rain-induced damage in Grant County. Overall, irrigated agricultural was doing well, while dry-land areas were still suffering from drought conditions. On June 9th, 2012, the high temperature at Pullman was a chilly 48 degrees. 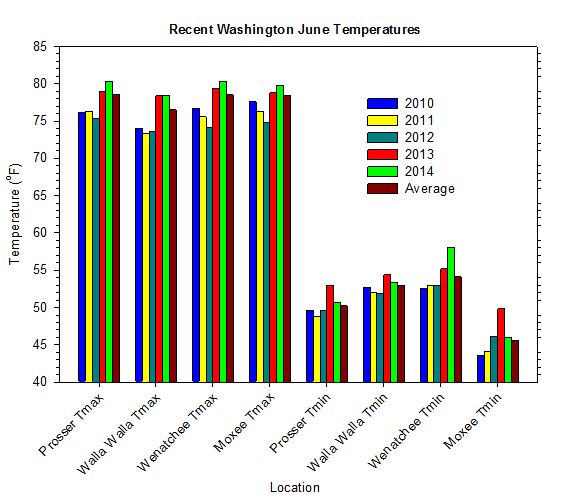 According to the Climate Prediction Center, above normal temperatures are expected in Washington during July and for the remainder of 2014 and well into 2015. There are no clear signals regarding precipitation during July, with drier than normal conditions becoming increasingly likely statewide during the autumn and early winter. El Niño is currently developing, and should be established by late summer or early autumn. A moderate to strong event is expected for the upcoming cold season.